TOKYO—Japan’s reputation for flawless manufacturing quality and efficiency transformed the country’s postwar economy, changed business practices world-wide and spawned a library’s worth of management manuals and business advice books. Now, the model is cracking. Kobe Steel Ltd. , Mitsubishi Materials Corp. and Subaru Corp. have all admitted in recent months to manipulating quality inspections, though all say no safety problems emerged. Takata Corp. declared bankruptcy last year after admitting to supplying more than 50 million defective vehicle air bags in the U.S. Mitsubishi Motors Corp. has admitted covering up vehicle faults and falsifying fuel-economy data. 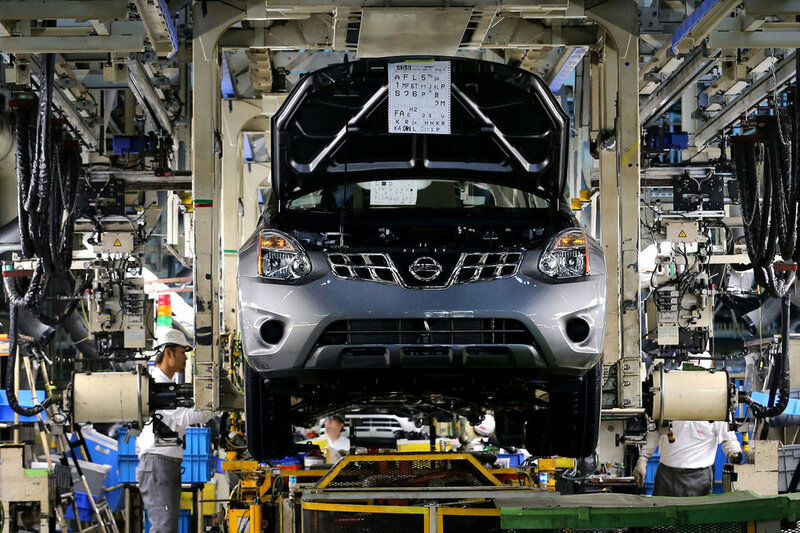 Nissan Motors Co. the world’s fifth-largest auto maker, disclosed in September that its Japanese factories let unqualified employees perform final quality inspections on some cars, a practice that might date back to the 1990s. During audits, foremen routinely provided trainees with badges from certified inspectors, the company said. Because results from new-car inspections are recorded on paper and stored in binders, it was nearly impossible to determine how many cars were affected, according to one person familiar with the process. Nissan recalled 1.2 million vehicles in Japan—nearly every one it produced in the three years through September. It says safety was never compromised. Corporate wrongdoing occurs the world over, but Japan’s scandals cut to the core of what has kept Japanese brands popular, as well as the country’s perception of itself. Japanese brands, once a byword for quality, score well on many quality surveys, but American car makers have bested them in the past two years in J.D. Power’s Initial Quality Study, and makers of other products are also catching up. Faked quality certifications for aluminum, copper and steel powder used by around 500 customers in cars, trains and other products. Faked quality certifications for airplane, car and power-plant parts used by more than 200 customers. Faked quality certifications for textiles used to strengthen car tires supplied to more than a dozen customers. Used unqualified inspectors for final quality approvals for cars sold in Japan. The scandals threaten to accelerate an erosion of Japan’s global market share for manufactured goods, handing main rival China further momentum in its march toward becoming the world’s largest economy. They also call into question one of the world’s most influential theories of management and manufacturing. Japan’s model, celebrated in publications such as Harvard Business Review, hinges largely on the concept of kaizen, often translated as “continuous improvement.” In practice, it means eliminating unnecessary activity, reducing excess inventory and using teamwork to fix problems when they arise. It places enormous responsibility on line workers at the factory-floor level, known as the genba, to manage daily operations and generate innovation. Those workers, viewed by many Japanese as craftsmen, have traditionally been guaranteed jobs for life in return for dedication to their company’s goals. In one oft-cited example, individual workers at Toyota Motor Corp. were given authority to pull a cord to stop the assembly line whenever they spotted a serious problem. Errant screws or tools on the factory floor were seen as major lapses in discipline, and corrected. The problem today is that many Japanese companies can no longer afford the luxury of guaranteed lifetime employment for craftsmen on factory floors. And delegating so much authority to line workers has left companies exposed to fraud and corner-cutting, while giving executives room to shirk responsibility, according to management consultants and corporate lawyers knowledgeable about the problems. “The genba has been broken,” says Hideaki Kubori, a Tokyo lawyer experienced in handling corporate scandals. The inability of companies to fully control it has resulted in a “kind of crisis” for Japanese industry, he says. Kobe Steel, based near Osaka, makes high-end steel products for trains, cars and rockets. It recently admitted to faking quality-certification documents for hundreds of thousands of products for more than 500 clients. An internal company report completed in October found that line workers were overworked as the company tried to maintain profitability, and executives were out of touch with the factory floor. Problems intensified during busy periods, says Takashi Ueda, a 24-year-old who works for a Kobe Steel subcontractor and makes final quality checks on wire used in car engine springs. When delivery pressure was tight, he says, Kobe Steel employees approved products he told them might fail to meet required standards. “There are occasions when we are forced to prioritize a quick shipment over quality,” he says. Hiroya Kawasaki, CEO of Kobe Steel, bowed as he left a news conference in Tokyo in October. One Kobe Steel employee who has worked for the company for three decades, as a factory manager and at headquarters, says pressure started to build on the genba after Japan’s bubble economy burst in the early 1990s. Quality-checking staffers became some of the first targets of layoffs because they didn’t appear as busy as production-line workers, he says. Line workers were told to make quality checks themselves, he says, and some checks were outsourced after the company suspended hiring. Workers involved in data falsification felt they had no choice because they needed to keep production moving, he says, and customers with urgent orders sometimes accepted products that didn’t meet specifications. Kobe Steel said in a written statement that pressure from management to achieve profits and meet production deadlines was one of the root causes of misconduct. The company said it has commissioned an independent investigation to provide recommendations for reform. Kobe Steel acknowledged in a November report that a “closed culture”—one in which factory workers dealt with problems themselves, often without senior executives in the loop—contributed to its scandal. Its leaders denied having knowledge of the issues before they became public. “It’s beyond my imagination how broad this problem has become,” Chief Executive Officer Hiroya Kawasaki said in an October press conference. On Dec. 21, Kobe Steel demoted three heads of business segments it said were aware of data falsification as far back as 2009. Kobe says it hasn’t found safety problems in most products it shipped, but is still investigating. 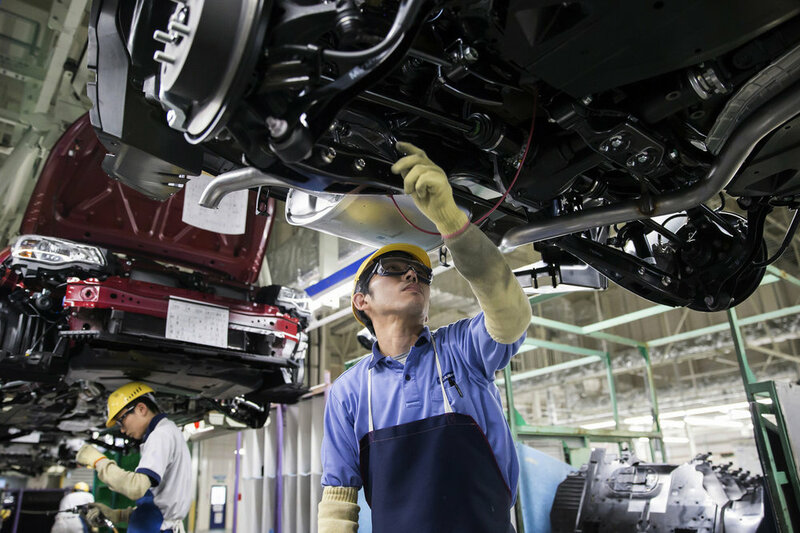 Japan remains a manufacturing powerhouse. It ranks No. 3 in manufacturing output, behind China and the U.S. and just ahead of Germany, according to United Nations data. Some $700 billion of Japanese goods are exported annually, mostly machinery, cars and parts such as screens and memory chips for iPhones and aircraft fuselages for Boeing Co. Japanese-owned factories are also a force in the U.S., making products for brands such as Nissan and Toyota in Kentucky, Texas and elsewhere. Powering Japan’s industrial might was a manufacturing model forged after World War II, when its companies sought to rebound by improving products for global buyers. Executives relied on an American management consultant, W. Edwards Deming, who advised companies to boost quality by empowering factory-floor workers to constantly focus on fixing problems. The approach married well with Japan’s ethics of hard work and attention to detail, and was widely adopted. Japanese exports grew in value more than 130-fold between 1950 and 1990. American companies obsessed over Japan’s success. Studies of how Japanese companies outfoxed U.S. rivals considered the impact of Zen Buddhism and martial arts, as well as Japan’s culture of building consensus. Ford Motor Co. and others tried to copy parts of the Japanese model, including its emphasis on keeping inventories low to control costs. There were also hints of shortcomings with the Japanese model. In a 1981 Harvard Business Review column, management consultant Peter Drucker wrote that Japanese executives spent very little time involved in operational issues, focusing instead on managing relations with customers, bankers and government officials. Even today, many executives at Japanese manufacturers have little formal management training, having risen up from the genba, and rely heavily on the workers who replaced them to deal with factory-floor problems. Manufacturing issues are rarely raised to the executive level, says Atsushi Osanai, a management professor at Waseda University in Tokyo. Other countries, including South Korea and China, have gobbled up Japanese market share for exports such as ships and electronics. A strong yen after Japan’s economic bubble burst reduced income from products sold overseas. Japanese manufacturers began replacing permanent genba workers, who receive benefits including holiday pay and a retirement salary, with temporary staff, who aren’t as invested in the long-term success of their companies. Panasonic Corp. says that less than one-third of genba workers at its appliance division are now permanent staff, a trend it says it hopes to reverse because it may be hurting its long-term business prospects. Takuya Shimamura, chief executive officer of Asahi Glass Co. , said his company has conducted a survey every year for about the past decade that asks workers whether they would follow orders from a boss to cover up product defects. A surprising number say yes, he said. “We’re now paying the price for reducing new [permanent] hires,” Mr. Shimamura said, adding that he regularly visits the company’s factories and urges employees to follow proper procedures. Weeks after Mr. Shimamura’s comment, Asahi Glass said a subsidiary had issued quality certificates for a scientific tube without conducting the proper test. It apologized and said it would fix the issue. Akihiro Nikkaku, president of Toray Industries, which said a subsidiary rewrote quality-control data on shipments of its fiber for auto tires. Some Japanese manufacturers have shifted to more technologically advanced products to cope with the loss of business to foreign rivals. Toray Industries Inc.,a maker of plastics, chemicals and other industrial goods, has posted record profits from high-end products such as fiber used in auto tires. Demand for such specialty products puts strain on the genba to accelerate innovation and boost quality control, says Hiroshi Osada, a Japanese manufacturing expert at Bunkyo University near Tokyo. In late November, Toray said a subsidiary rewrote product-quality data on shipments of its fiber for auto tires and other products, with data manipulation as far back as 2008. The company said its actions didn’t violate any laws or raise safety issues. It declined to comment further. After a subsidiary of Mitsubishi Materials rewrote test data on some products for more than 15 years, the company said in a report that employees had struggled to meet official quality targets for new products for electrical systems for cars. “Taking on impossible business caused many products to fail to meet standards, and this may have led to the inappropriate actions in this case,” the report found. The company declined further comment. Nicholas Benes, co-head of the Board Director Training Institute of Japan, who helped write Japan’s corporate-governance code, believes the solution isn’t to throw out Japan’s manufacturing model. He says the answer lies in tougher corporate governance, including forcing executives who oversee business divisions to face legal liability for scandals. In recent admissions of quality-inspection faking, Japanese executives have repeatedly claimed they had no knowledge of problems. Subaru executives and plant managers said they had no idea workers had created an unofficial training regimen for quality inspectors, including purposely sending cars with defects down the line to see if newcomers could detect them. A 2004 whistleblower law that guarantees protection for anyone reporting improper workplace activity has had limited success, corporate lawyers say. Japan’s genba culture emphasizes dealing with problems within the employee’s work team rather than raising them higher. “When you cross the road on a red light with other people, you don’t feel bad. It’s something such as that,” says a 72-year-old Kobe Steel employee who has worked there for decades. Mitsubishi Materials President Akira Takeuchi, third from left, bowed at the beginning of a news conference in November after the company admitted a subsidiary falsified quality data. A corporate-governance code introduced in 2015—Japan’s first—called for companies listed on Japan’s main stock market to have at least two outside directors. Most companies have done so. The code says outside directors should satisfy Tokyo Stock Exchange rules for independence, but in some cases, the new directors have connections to the companies. Some experts on Japanese industry see the recent string of scandals as a positive sign that problems are surfacing and being addressed. Others note that some Japanese quality standards may be unrealistically high. Employees of manufacturers, confident their products are of sufficiently high quality, may feel it is OK to ship some that don’t meet full specifications, says Mr. Osanai, the Waseda University professor. Sadayuki Sakakibara, head of the Japanese business federation known as Keidanren, has urged companies to improve governance and ethics, but recently apologized himself after Toray revealed its quality faking scandal. Mr. Sakakibara was president of Toray at the time of that company’s wrongdoing. He said he had no idea about problems on the factory floor.